A Grand Opening for the Greater Milo/Brownville and Points North Visitor Center will be held at Kiwanis Headquarters, in the Milo Business Park, on May 18, 2018 from 10am to 12 pm. The Greater Milo/Brownville Area and Points North Visitor Center was officially gifted to the Milo/Brownville Three Rivers Kiwanis on April 9, 2018. It is the fifth building that Tom and Nancy Harrigan have built and donated to the Milo/Brownville Three Rivers Kiwanis including the Kiwanis Headquarters, the Harrigan Learning Center and Museum of Fossils, Minerals, and Indian Artifacts, the Auction Storage Facility, and the nearby Harris Pond Pavilion; each of the buildings designed with different approaches to make the Greater Milo/Brownville area a better place to live. Initially, the new Visitor Center will be staffed by Tammy Knowles, Gayle LaVallee, and Beverly Martell. The new Visitor Center was strategically placed adjacent to the Harrigan Learning Center and Museum of Fossils, Minerals, and Indian Artifacts, undoubtedly drawing even more tourists to Museum, which has been an enormous asset to the region, providing interesting exhibits and wonderful learning opportunities, and in turn, financing Kiwanis Projects through the entrance donations to help children and the community. As tourists and visitors travel through this part of the region, they can take advantage of the Center’s new accessible quality rest rooms, also placing the Kiwanis in a better position to have outdoor events such as Jazz Festivals, Antique Car Shows, Company Picnics, ATV Vehicle Shows, and more. The Center’s space is large enough to accommodate the establishment of a consignment venue to support the sale of items produced by local artists, authors (who can also use the space for book-signing events), quilters, basket makers, and crafters. Along the inside walls of the center, visitors will find write-ups by Tom Harrigan and paintings by Suzette East that highlight attractions and events. Filling the space will be displays provided by Town of Milo, Milo Historical Society, Town of Brownville, Brownville Historical Society, local authors, Cub and Boy Scouts, Kiwanis, Harrigan Learning Center and Museum, and Penobscot Mineral and Lapidary Club. This, of course, will also be beneficial to new residents of our area, helping them become better acquainted with our history and current offerings. Further benefiting the community, the new Visitor Center will provide a venue for smaller-scale business meeting rentals, relieving some of the demand on the larger Kiwanis Headquarters Building, which is usually rented or used for larger affairs or events. The Greater Milo/Brownville Area & Points North Visitor Center will provide additional electric power to reduce or eliminate monthly electrical operating costs for the entire Kiwanis complex; thirty-six solar panels have been added, increasing the total number of solar panels to seventy-two within the complex and each solar panel has a capability of generating 285 watts of power under ideal conditions. 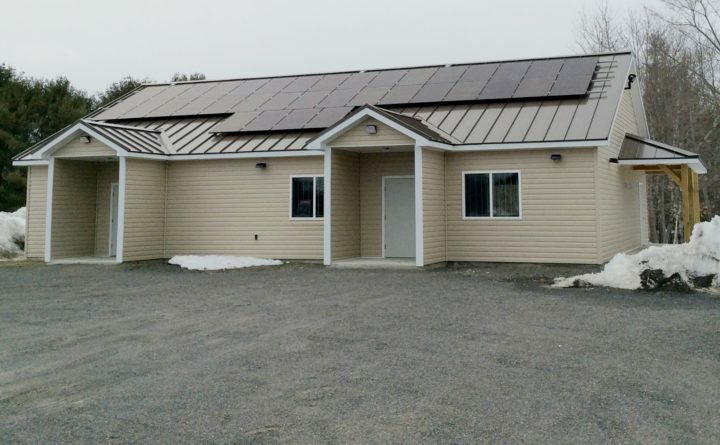 Within the space, predominantly LED lighting throughout means most of the power generated by the new solar panels will go to providing power to the other Kiwanis buildings in the complex, making this a smart and environmentally responsible project. The Grand Opening Celebration & Chamber Ribbon Cutting Ceremony is open to the public and will begin at 10am on Friday, May 18th, followed by refreshments and a tour of the center.